This flatware set is perfect for little hands and fun loving eaters, featuring the Teenage Mutant Ninja Turtles. The smaller size and rounded handles allow for a better grip and encourages independent eating. Each set comes with one spoon and one fork. Made of stainless steel and BPA-free plastic. They are easy to clean, dishwasher safe, but do not microwave. By Zak Designs, making mealtime fun. 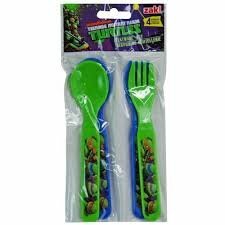 Teenage Mutant Ninja Turtles 4pc Fork & Spoon Set. For gnarly style, your party guests will love wearing any one of these Teenage Mutant Ninja Turtles rubber bracelets! 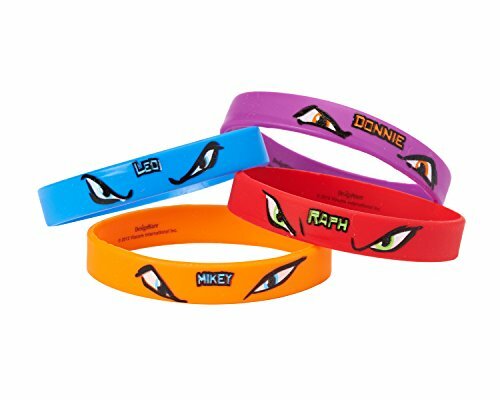 Great as party favors or prizes, colorful wristbands come in four different designs: red for Raph, orange for Mikey, purple for Donnie, and blue for Leo! One size fits most children. 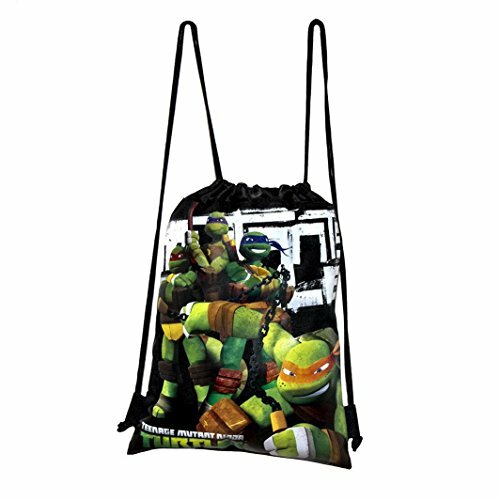 They're the perfect party accessory item for a Teenage Mutant Ninja Turtles-themed birthday party!. 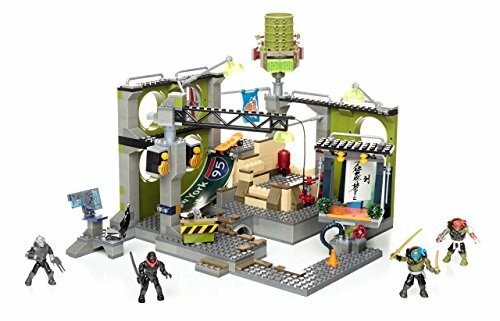 When Shredder and a Foot Soldier launch a surprise attack, all chaos breaks loose at the Teenage Mutant Ninja Turtles: Out of the Shadows Lair Hideout by Mega Bloks! With the Turtles’ sewer sanctuary under fire, you can recreate this awesome brawl when you build the hideout, complete with a waterslide, skate ramp, retractable zip line, and different, customizable areas for each of the Turtles! Help Leo prepare an attack plan in his zen space, spinning the revolving wall to reveal a hidden katana! Ready Raph by helping him with his moves in his training room! And when the other brothers come home, you can set them up at the computer station and DJ table! Then, set a Turtle up at the lair’s sewer cap launcher which features shock sensor LED lights and sounds! Connect with other Mega Bloks Teenage Mutant Ninja Turtles: Out of the Shadows sets to build your own movie-themed brawls! Ideal for ages 6 and up. 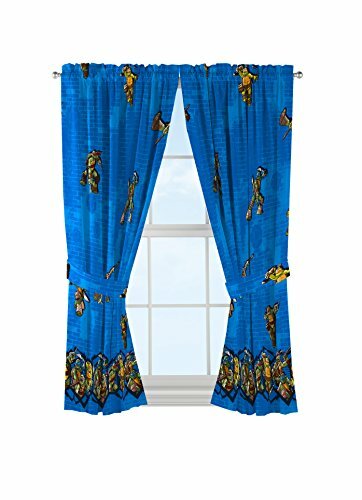 Transform any child's bedroom windows with decorative, bright and fun Nickelodeon teenage Mutant Ninja Turtles decorative curtain draperies. Perfect for the bedroom, kid's room or playroom, these curtains will certainly make them smile. Set includes two rod pocket curtain panels and two coordinating tie backs. Decorative curtain header for added style. Tie backs allow you to easily open and close curtains to create privacy and control how much light gets into the room. Layer on sheer panels behind these curtains for a layered look and privacy. Sheer panels not included. Each rod pocket panel measures 42 inch wide by 63 inch long. Total curtain width is 84 inch wide. Fits standard 1 inch curtain rod. Curtain rod sold separately. 100percent soft microfiber polyester. Machine wash gentle cycle, tumble dry, do not bleach. Cool iron if needed. Imported. Mutants rule! 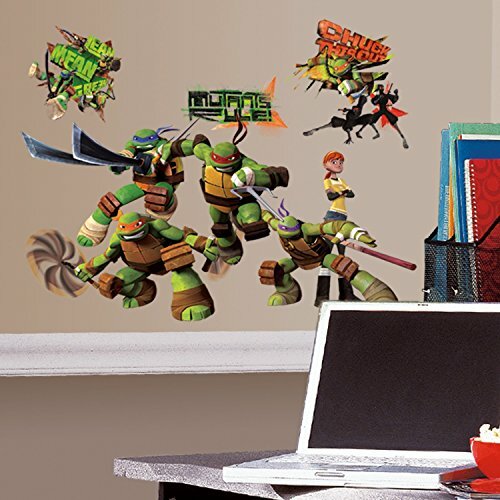 Bring Leonardo, Michelangelo, Donatello, Raphael, and more of your favorite TMNT characters to life on your walls with these stylized Teenage Mutant Ninja Turtles wall stickers. These removable and repositionable wall graphics combine images of the Turtles in action with cool phrases and elements. They can be applied to any smooth surface and repositioned over and over again without damage. A great decorating idea for any TMNT fan, young or old! 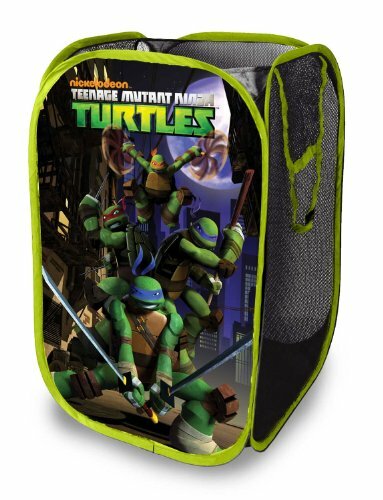 The Nickelodeon Teenage Mutant Ninja Turtles Pop Up Hamper makes a perfect addition to your child’s bedroom, closet, or playroom. The pop up hamper is an easy way to maintain organization while adding a playful accent. Your childs will love to put away all her toys, books, clothing, and more in this spacious storage hamper featuring his or her favorite turtles. It's made of 100 percent polyester with mesh siding and reinforced carry handles. Collapsible and lightweight, our pop up hampers are perfect for storing just about anything. When not in use, it can fold down flat and be tucked away. They are also available in other Nickelodeon and Disney characters such as Minnie Mouse, Spongebob Squarepants, and Doc McStuffins. Never let children fold or unfold this hamper. This item is for storage only and should not be used as a toy. Children should not play inside of the hamper. Keep away from open flame. Easy to clean using a damp cloth. Discontinue use if frame is bent or broken. Do not drag hamper on the floor. Do not give to children under 3 years of age due to loose parts. 10 NINJA TURTLES TOYS WORTH MONEY - RARE ITEMS YOU MIGHT OWN! !